Last weekends adventures took me to Brussels and Bruges. The land of Belgium chocolate, waffles, double deep-fried fries and much more tempting non-raw delicatesses. My Aunt and Uncle were dying to see and eat everything in the city. So we hit all the sites, visiting several chocolate shops and walked down the tiny cobblestone alleyways. 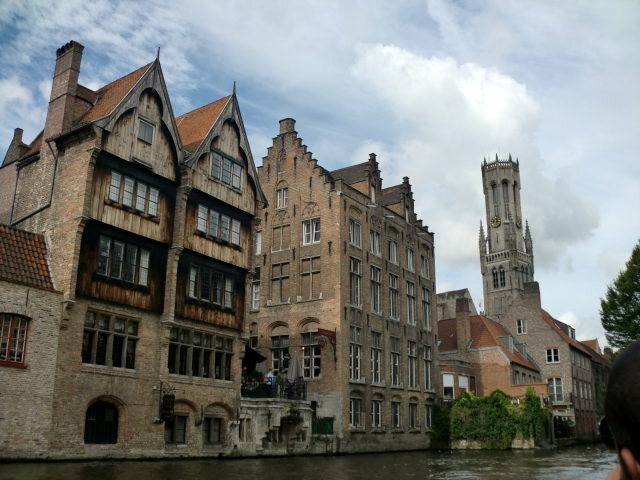 We also took a canal cruise in Bruges, a gorgeous almost fairytale like Medieval village. I was so fascinated with how well-preserved the village was and just adored every building whether it was the Church of our Lady with Michelangelo’s Madonna and Child, the Belfry bell tower or the historic Grote Market Square, a World Heritage Site of UNESCO. My Uncle, a professional photographer was making us walk at the speed of a snail with all the photos he was taking. I didn’t mind since the city was eye candy in itself and I’m hoping you could see why! While in Brussels we decided to participate in a chocolate making course at Planète Chocolat, which made our trip truly rememberable! And as soon as I got home I went to work on these raw Raspberry Belgium Chocolates. 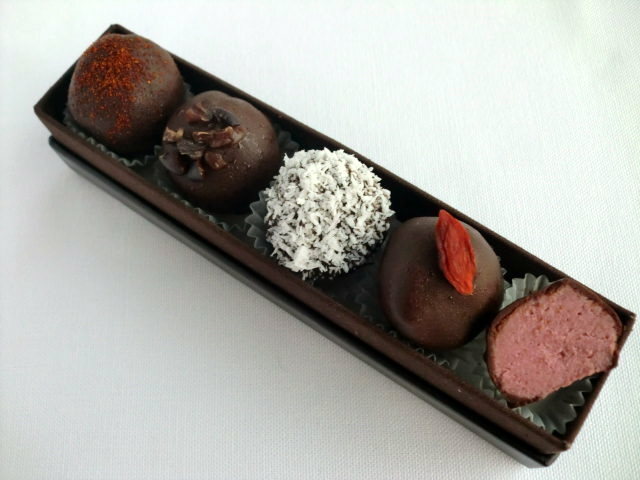 Filled with a light Raspberry Cream, coated with a dark Belgium Chocolate and topped with either chilli powder, cacao nibs, coconut, goji berries or left to their original dark chocolate shell. They are incredible soft, melt in your mouth and I believe they would have made our Chocolatier at Planète Chocolat very proud! Blend the dates and water until completely incorporated and resemble a paste. If it is still too stiff add more water 1 tbls at a time. Remove from the blender and set aside. Blend the raspberries and lemon juice briefly and pour into a mesh sieve over a glass bowl in order to filter out the seeds. Use a spatula to move and push the raspberry pulp around in order to separate the juice from the seeds. The raspberry juice should yield 1/2 c of juice. Blend all the ingredients until completely smooth. Pour into a bowl and cover with plastic wrap. Let set in the freezer for 20 min or until solid but not frozen, or leave overnight in the fridge. To shape into balls, use a 1/2 tbls size measuring and scoop out the cream onto a wax paper surface. Roll into balls using the palm of your hands. The Raspberry Cream is a very soft cream so it starts to get too soft, then return to the freezer for 10 minutes or until solid. Once all the balls are rolled, return to the fridge until just before they are ready to dip into the Belgium Chocolate. Bring 2 cups of water to a simmer in a small saucepan. Place the cacao butter in a medium size glass bowl and place the bowl over the top of the saucepan. Stir with a wooden spoon until the cacao butter is completely melted. Stir in the agave, vanilla, salt and chili powder. Turn off the stove and while continuing to stir, shift in the cacao powder. 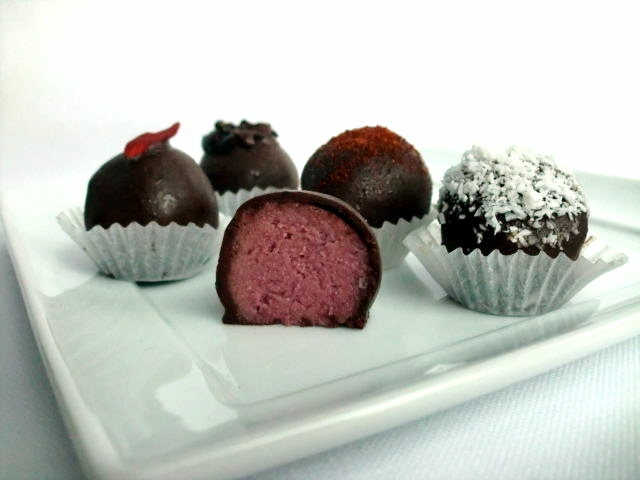 To dip each ball in the chocolate, place a toothpick in each of the Raspberry Cream ball. Dip it in the melted chocolate and continue to turn the ball until all the excess chocolate drips off. Holding the chocolate covered ball upright, slide just the tip of a fork off under the ball, very carefully slide the ball onto a non-stick sheet. Repeat until all the balls are covered. If you like to add a little extra to the Raspberry Belgium Chocolate top with either chilli powder, cacao nibs, coconut or goji berries. Place back in refrigerator to set the chocolate. This entry was posted on September 12, 2010 by Olive. It was filed under Uncategorized . These look gorgeous! And so do the travel pics! Wow, so serene! dang girl, those are beautiful! Yummy!….so pretty and perfect! Love the photo’s! Hugs! Love these!!! What a gorgeous idea!!! I wish I could try one! Hugs! Oh. my. GOD!!! this looks so so so good!!! I’m actually drooling right now! These are beautiful! I was just getting ready to make them. I assume the 1/4 measurement for the Cashew is cup. Is the cacao butter measured before or after melting? Thank you, Carla! Yes, it is a 1/4 c of cashews. And the cacao butter I tried to measure as best as I could in the solid form and then added more once it was melted if it looked too little. Let me know how they turned out! Thanks, Carla. I hadn’t seen your response and had gone ahead with the 1/4 cashews. My truffles didn’t turn out at all. As Gayla wrote below, the filling wasn’t firm enough to roll, and my chocolate curdled. Several people asked whether I had gotten some water into the chocolate. I’m sure I hadn’t. I will try this recipe again another day when I’m feeling brave because they look absolutely delicious! Thanks for all your inspirations. Hi, I really love this idea, ideal as a sweet gift. I would like to know: what do you recommend to package chocolates? Thank you! You can package the chocolates in any box or container using wax paper or mini cupcake papers (as shown in the first picture) to seperate them from damaging in transit. wow! those look amazing! I will surely try them out! These are through the roof amazing. I didn’t know that it was your recipe when I found them on goneraw.com. I thought they were Russell James, IDK why I thought that?? They are so beautiful and elegant. You are very talented!!! Just so you know~ The chocolates were a HUGE hit!!!!!! Bravo and Thank you! I am so happy to have found your blog. I love the travel pictures and those raspberry truffles look amazing! Look forward to more! I made these the other night. I must have done something wrong…they never got firm enough to roll into balls, until they froze. (it was kind of mousse texture) That’s okay. I am not easily discouraged. I scooped out the frozen filling with a round scoop and “plopped” it down on a parchment paper lined cookie sheet, then returned to the freezer. When the chocolate was ready, I scooped them up with a fork and dipped them and put them back on parchment paper. They are amazing! I keep them in the freezer. They remind me of those little ice cream bites! You can’t go wrong with this. Thank you, Carla! BTW, mine weren’t nearly as pretty as this, but still looked fine. My children are asking if they can “go raw”, too! WooHoo! Hi Carla! Your photos of Bruges are so beautiful. Thanks so much for sharing your lovely chocolate recipe, they are absolutely delicious! ich und mein Sohn lieben Deine Himbeere Pralinen in belgische Schokolade und Clementinen Törtchen, sie schmecken köstlich und sehen wunderschön aus! wir haben sie schon 2 mal nachgemacht und damit auch unsere Freunde begeistert, vielen Dank, dass Du Deine wunderbare Rezepte mit uns teilst und für die Inspiration! Ich berichte Dir bald über die Sacher Torte, die übrigens noch besser schmeckte als die gebackene, so weit ich mich noch erinnern kann :-).freue mich aufs ausprobieren und auf weitere Rezepte von Dir! Du machst das toll Carla! Hello, I want a chocolate that does not include the filling but that does not melt out of the fridge what could I add to your recipe for this? Thanks you have a lovely site. Hello Michelle, you can try substituting caco butter in the place of the coconut oil. That will make the chocolate more solid. The recipe for the chocolate does not have coconut oil ony butter and it is just the outside chocolate that I want to harden without losing the taste.